Hi Connie, here with you today. I love finding new ways to use my dies and I love this idea of changing our dies into stamps, using those foam sheets we find at our craft stores. I used the Memory Box, Bella Bouquet die today to use for my stamp, and I ended up with 3 cards. 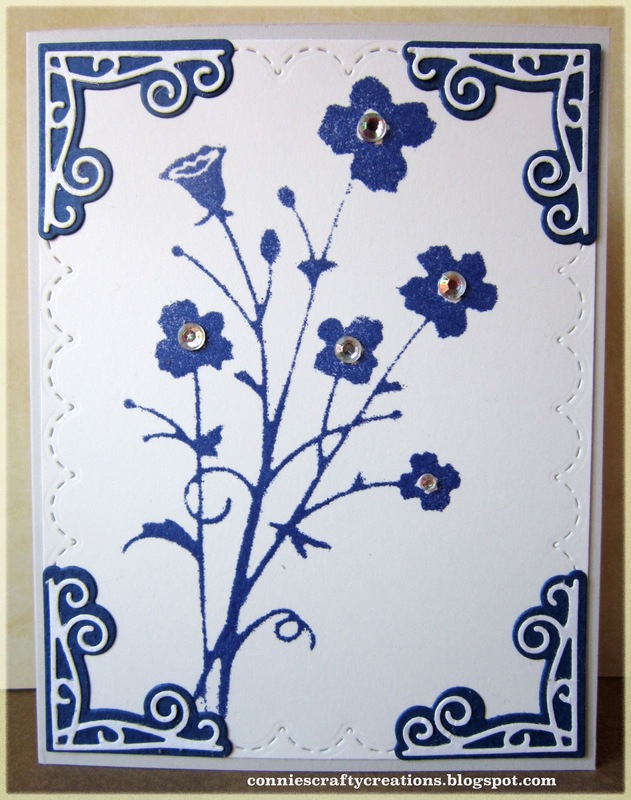 On this first card I also used the Poppystamps Colonnade Corner, they don't seem to have this particular die in right now but they did have some other corner dies in the Poppystamps new release section. 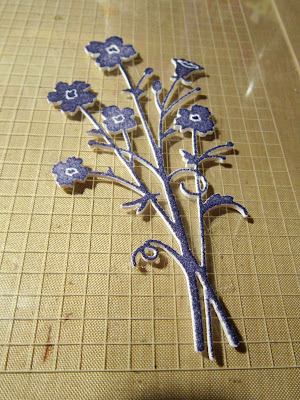 Memory Box - Country stitches dies where also used on this card and my second card. 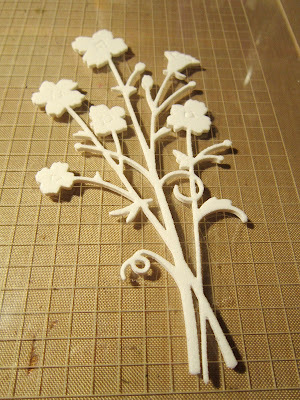 First I cut the bouquet from fun foam. My tip for you is to just run it through your machine one pass. I tend to cut my dies by running it through and then back again but I noticed that when I do this the foam tends to shift and you don't get a good cut, so just run it through one way and it will cut fine the first try. As you can hopefully see in this photo I added double stick tape to the back of my foam cut die and adhered that to my misty. You can use what ever you normally use for your stamping of clear stamps. This next photo shows the ink applied to the foam, here is where I was happy to have my MISTI tool because it took a few stampings to get a good coverage but I also used Memento dye ink, I am thinking if you try a pigment ink it may be a bit juicier and you may be able to get good coverage in one stamp, I did not try any other inks. 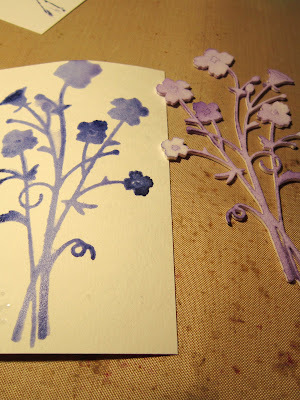 Now after stamping I sprayed my foam stamp with water and got a great idea to try and stamp again onto watercolor paper this time to see what kind of watercolor look I could get, and this is what I ended up with. 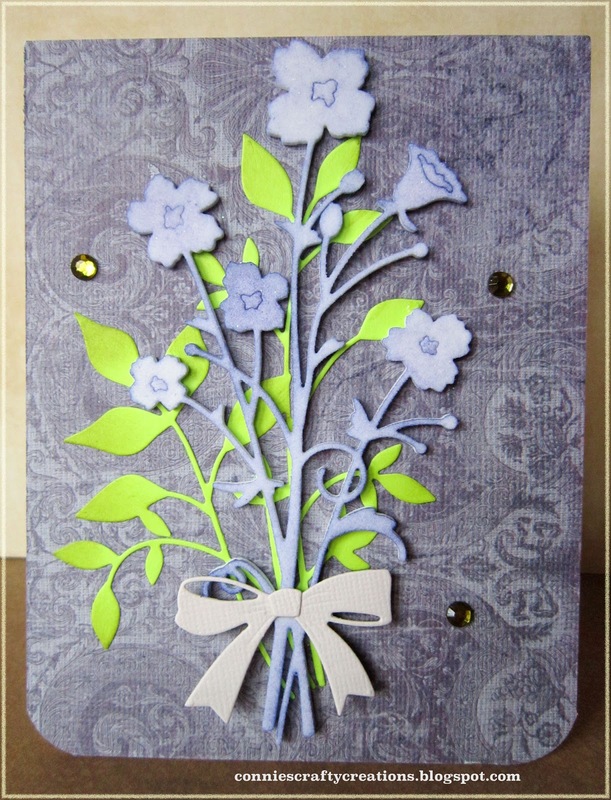 This is the card I made with the watercolor panel. Now as you see after stamping the watercolor panel there was still a touch of color onto the foam stamp, and it ended up being almost a soft purple and I thought wow I could make another card out of the foam stamp and that is when I came up with my last card. I also used the Memory Box, Fresh foliage die and the Poppystamps, Lovely gift bow die, whidh I love how it gives you a bow but not all the thickness that a real bow gives. Here are pictures of the dies I used. Love this idea Connie! 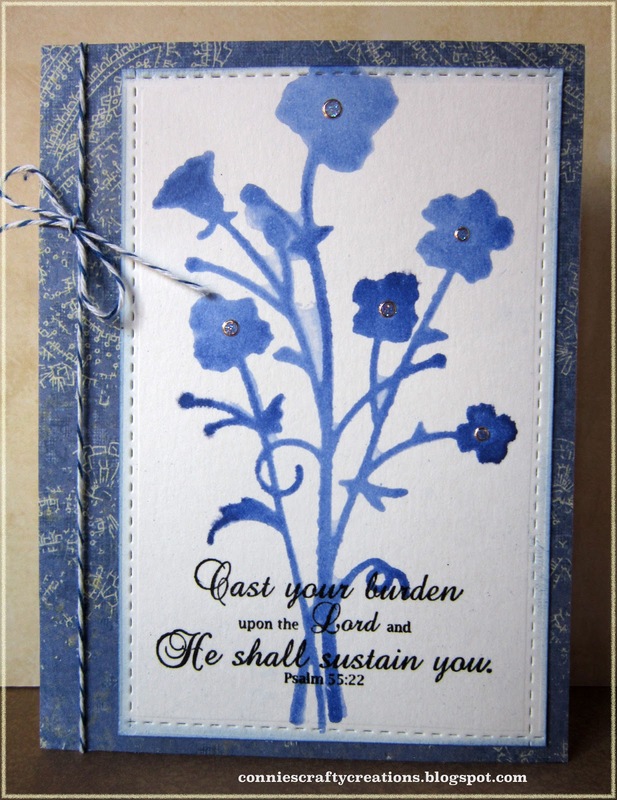 What a fabulous way to get more use from your dies. All of your cards are so pretty, such a delicate effect. Thank you for the inspiration. Awesome idea and great use of your die cut! Your cards are fabulous! Thanks for always sharing fun ideas and wonderful inspiration! Connie I just love this idea! Your card is as sweet as can be. Thanks so much for the inspiration!!! I've heard of making your own stamps that way but have never tried it. Yours came out great and nice that you could get three yet besides and all totally different in a way. Thanks for your inspiration. Beautiful cards, Connie. I love the colors you used on all of them. Great idea Connie. Love your cards.